Ida – Researchers from the University of Oslo have suggested the specimen, which was found 95 per cent complete, may be the root of anthropoid evolution, when primates were first developing the features that would evolve into our own. 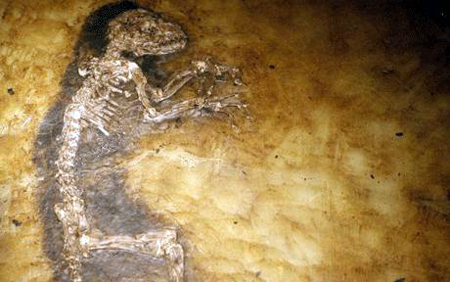 Discovered in Germany, Ida is so well preserved that even the outline of its fur can be seen. An incredible 95 percent complete fossil of a 47-million-year-old human ancestor has been discovered and, after two years of secret study, an international team of scientists has revealed it to the world. The fossil’s remarkable state of preservation allows an unprecedented glimpse into early human evolution. 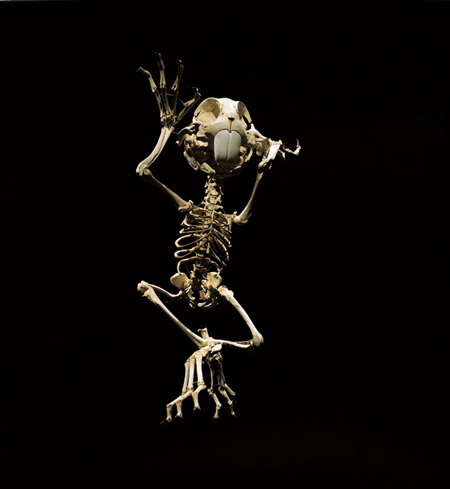 Discovered in Messel Pit, Germany, it represents the moment before anthropoid primates–the group that would later evolve into humans, apes and monkeys–began to split from lemurs and other prosimian primates. This groundbreaking discovery fills in a critical gap in human and primate evolution. Homo Stupidus Stupidus, 2009 A.D.
Just as we trace our personal family trees from parents to grandparents and so on back in time, so in The Ancestor’s Tale Richard Dawkins traces the ancestry of life. As he is at pains to point out, this is very much our human tale, our ancestry. The Ancestor’s Tale takes us from our immediate human ancestors back through what he calls ‘concestors,’ those shared with the apes, monkeys and other mammals and other vertebrates and beyond to the dim and distant microbial beginnings of life some 4 billion years ago. It is a remarkable story which is still very much in the process of being uncovered. And, of course from a scientist of Dawkins stature and reputation we get an insider’s knowledge of the most up-to-date science and many of those involved in the research. And, as we have come to expect of Dawkins, it is told with a passionate commitment to scientific veracity and a nose for a good story. Dawkins’s knowledge of the vast and wonderful sweep of life’s diversity is admirable. Not only does it encompass the most interesting living representatives of so many groups of organisms but also the important and informative fossil ones, many of which have only been found in recent years. Dawkins sees his journey with its reverse chronology as ‘cast in the form of an epic pilgrimage from the present to the past [and] all roads lead to the origin of life.’ It is, to my mind, a sensible and perfectly acceptable approach although some might complain about going against the grain of evolution. The great benefit for the general reader is that it begins with the more familiar present and the animals nearest and dearest to us?our immediate human ancestors. And then it delves back into the more remote and less familiar past with its droves of lesser known and extinct fossil forms. The whole pilgrimage is divided into 40 tales, each based around a group of organisms and discusses their role in the overall story. Richard Dawkins first introduced the word in The Selfish Gene (1976) to discuss evolutionary principles in explaining the spread of ideas and cultural phenomena. He gave as examples melodies, catch-phrases, and beliefs (notably religious belief), clothing/fashion, and the technology of building arches. Meme-theorists contend that memes evolve by natural selection (in a manner similar to that of biological evolution) through the processes of variation, mutation, competition, and inheritance influencing an individual entity’s reproductive success. Memes spread through the behaviors that they generate in their hosts. Memes that propagate less prolifically may become extinct, while others may survive, spread, and (for better or for worse) mutate. Theorists point out that memes which replicate the most effectively spread best, and some memes may replicate effectively even when they prove detrimental to the welfare of their hosts. 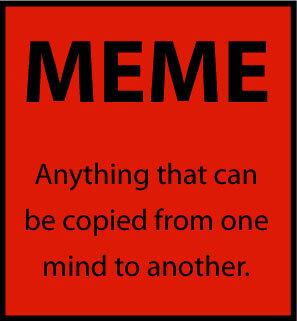 A field of study called memetics arose in the 1990s to explore the concepts and transmission of memes in terms of an evolutionary model. Criticism from a variety of fronts has challenged the notion that scholarship can examine memes empirically. Some commentators question the idea that one can meaningfully categorize culture in terms of discrete units. A black room frames the installation, which is dramatically spot-lit. 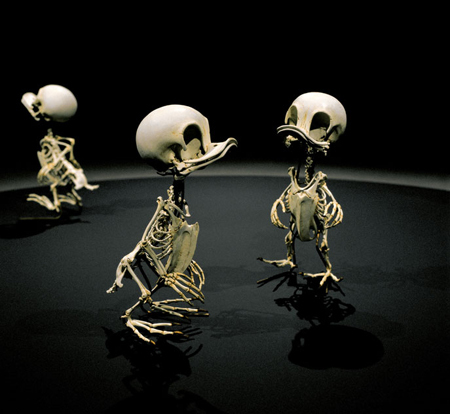 A presentation of two skeletons, not unlike what one might see in a museum of natural history; a predator chasing its prey. Then the dawning – it’s Wile E. Coyote and The Roadrunner! Reduced to a science exhibit! Brilliant, clever and very, very funny. Once the laughter subsides, something very interesting begins to emerge. The work is not merely clever or amusing in the way that Cattelan’s taxidermy animals are. There’s a whole new bit of forensic activity at work and the viewer is drawn into an exploration of the process behind this reductio ad absurdum. First of all, cartoon characters are not real; they are two-dimensional exaggerations of human behaviour. Yet, over time, they have entered the pantheon of global popular culture and are more recognisable than the real personalities that shape our world (Just consider the multi-national empire that is Disney). Our own predisposition to anthropomorphise furry (and feathered) creatures allows us to endow them with personalities that reflect our own and to place them in situations that mirror the trials and tribulations of our daily lives. So, if these cartoon figures can represent us in a simplified, yet extreme form, it follows that this form can be deconstructed and analysed. Lee Hyungkoo’s approach eschews the pop psychological approach to deconstruction. What he is doing is actually physical deconstruction – more pop palaeontology – and it is detailed, thorough and completely worked through. This was Lee’s original idea for the title of the exhibition. As a play on ‘family tree,’ he was looking to describe the evolution of his creations and to evoke the empathy we all have with these animated characters. 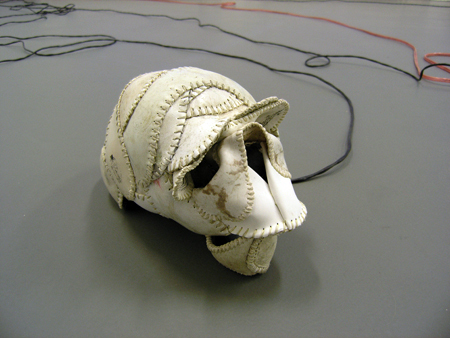 This new body of work began with Homo Animatus of 2002–2004. This was an homunculus – Latin for ‘little man’ – a cartoon exaggeration of human form (think of Elmer Fudd as a skeleton). The original homunculus was a creature with magic powers that medieval alchemists claimed to have created. Considering that Lee’s studio looks more like a laboratory than a typical artist’s atelier, the connection is even more easily drawn. Plus cartoon characters do possess incredible strength, resilience and resourcefulness: how many times has the Coyote fell off a cliff, only to rebound fully-intact in the next frame? Homo Animatus was an extension of a series of earlier pieces where the artist physically sought to alter – to reduce to cartoon simplicity – his own anatomy. Using plastic forms, enlarging and reducing lenses, Lee created a variety of body costumes that altered both one’s appearance and one’s vision of the real world at the same time. Homo Animatus is, for Lee, the ‘Origin of the Species;’ in a peculiar and devolutionary way, of course, and in keeping with how animated creatures serve as stand-ins for their human counterparts. Canis Latrans Animatus (Wile E. Coyote) and Geococcyx Animatus (Roadrunner) followed and are now joined by Lepus Animatus (Bugs Bunny), Felis Catus Animatus (Tom), Mus Animatus (Jerry), Anas Animatus (Donald Duck) and his three nephews, Animatus H, D and L (Huey, Dewey and Louie). ‘Familiar Tree’ remains an appropriate description for this body of work. These are the ‘skeletons’ of characters/personalities that are as close to us and as instantly recognisable as our own inner frames. Stories of any kind usually require a build-up before offering the denouement. The joke involves a narrative before providing the punch line. Lee Hyungkoo works backwards. Merely seeing the work gives no clues to the complexity of its creation. Visually, the work can strike a chord and delight, amuse or bewilder, but examining its origins and development frames it properly. Lee’s studio is a laboratory and could not be further removed from a scruffy artist’s garret. With a white-coated, masked team of technicians working in ‘clean rooms,’ the space is unlike any other. 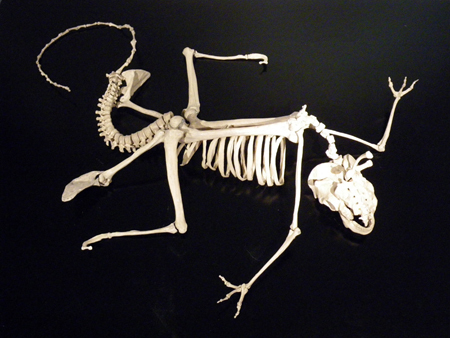 Bones of real animals sit on shelves alongside those of the works in progress. Clay constructions of skulls of imaginary characters provide a reference to those reconstructions of our fossilised ancestors. 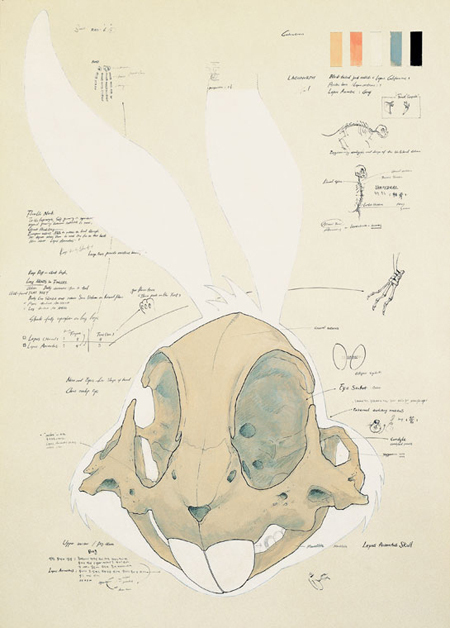 The walls are adorned with drawings of the anatomies of both real animals and their animated renditions. The tools and working methods are more akin to the procedures seen on the Nature Channel than the usual brush and paint-pot strewn environments one usually associates with the creation of contemporary works of art. The work itself, while sublime, delightful and amusing, requires an in-depth understanding of how all of this came to be in order to be fully appreciated. Observing the creation of this various works does provide the modus operandi behind Lee’s work, but where does the origin of the Origin of the Species lie? Lee has cited Rodin and Giacometti as sculptural artists to whom he has responded within the development of his own work. Rodin was a breakthrough artist who sought to imbue the natural human form – warts and all – with a heroic sense of space, rejecting along the way the idealisation of the body that was previously the hallmark of Western sculpture. Rodin changed the way one could look at the human figure much in the same way that Lee’s optical helmets and body-distorting devices create alternative physical realities. Giacometti’s own work passed through a number of critical stages – representational, cubist and surrealist – until he reached his apogee in Post-War Europe and sought to render the human form in all its existential angst. Giacometti found the inner reality of man. Lee has spoken about the ability of these two artists to create a new sense of sculptural space. 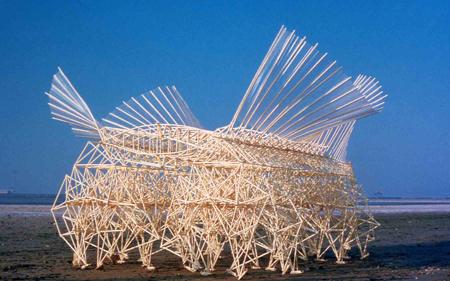 ‘Space’ is a concept that all artists working in three-dimensions must come to terms with. With this new body of work Lee has gone from the virtual space defined by his Objectuals series and has made the virtual a reality. Jansen is dedicated to creating artificial life through the use of genetic algorithms. These programs simulate evolution inside their code. Genetic algorithms can be modified to solve a variety of problems including circuit design, and in the case of Theo Jansen’s creations, complex systems. Some measure of “fitness” is introduced into the algorithm; in Theo’s case it is to survive on the beach while moving around within two enclosing lines on the wet sand near the ocean, and the dry sand at the edge of the beach. Those designs best at the assigned task within the modeled beach environment are bred together and graded again. Over time complex designs emerge which sprout wings and flap in the breeze pressurizing what look like plastic 2 liter soda bottles. 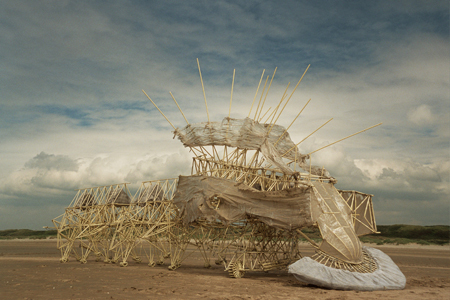 Articulated legs sprout and scuttle across the sand like those of a crab. Theo uses plastic electrical conduit to make some of the computer’s most promising designs. He then lets them roam free on the beach, measures their success, and updates his model. Brian Jungen (b. British Columbia, Canada, 1970) is part of a generation of Vancouver-based artists currently bursting onto the international stage. Born to a Swiss-Canadian father and First Nations mother and raised in the Dane-zaa nation, his drawings, sculptures and installations explore elements of his own hybrid cultural identity. Yet, his approach transcends questions of ethnicity to explore the complex exchanges of goods and ideas in our globalized world. 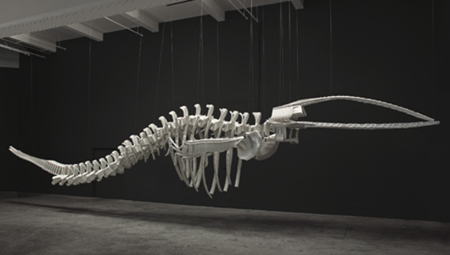 Jungen’s reputation was secured by his magnificent whale ‘skeletons’, large suspended sculptures made from cheap plastic deckchairs. His rendering of rare and endangered whale species in non-biodegradable mass-produced objects also refers to current debates about whaling practices in Canada. Representing the postmodern, postcolonial world with a wry sense of humor, Jungen collapses stereotypes and embraces change, flux and instability. Offering new ways of thinking about multiculturalism at a time when the famous model of Dutch ‘tolerance’ is under close scrutiny, his practice approaches cultural difference as an unstable, reciprocal notion, using it as a starting point for creativity and critical reflection. 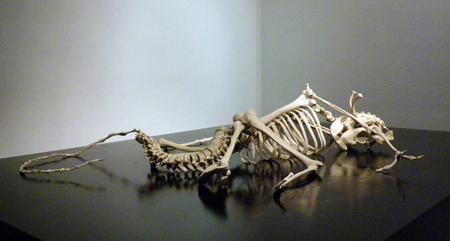 You are currently browsing the archives for the Osteology category.